I actually enjoyed driving through a serious rainstorm on the way home from school today, just the way I sometimes enjoy the various storms that get stirred up during my English classes. 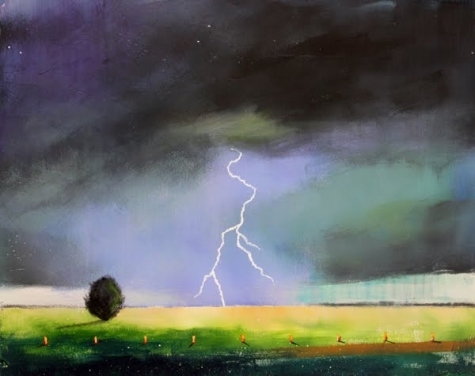 For some reason, I decided to loosen up and simply take pleasure in the slanting lines of rain across the fields as I drove along, and it sometimes occurs to me to do the same during class. When my lesson seems to be flying apart in all possible directions, or when the students seem to be settling into a midday stupor as I’m speaking to them about some obscure literary issue, I can occasionally step mentally back from the situation and smile to myself as I observe the passing “storm”. Everything seems to be going wrong, but yet it seems to be going wrong quite impeccably. My lesson might be falling apart, but it’s falling apart in a perfectly suitable and graceful manner. If this sounds strange, perhaps it’s no stranger than seeing a sinister-looking storm as something astonishingly beautiful.